This month is all about my Canadian adventures. 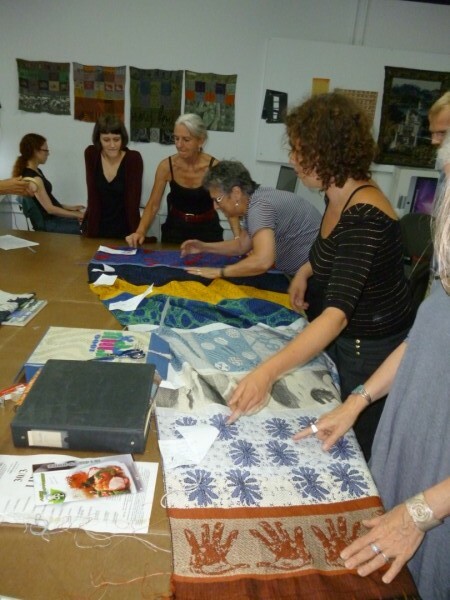 Montreal and the Contemporary School of Textile Design was the focus of the trip. 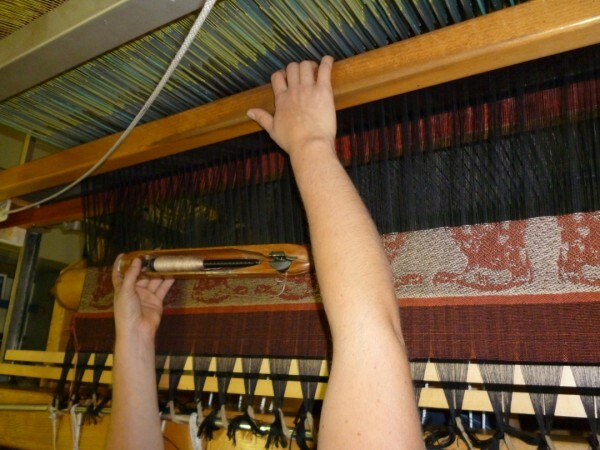 I had decided that I needed to learn more about design and weaving using Jacquard looms. The entire two weeks was spent under the expert tutorage of Louise Bebure´ and her offsider Lheila. The focus was on designing on the computer with no hands on loom experience. Technicians wove sections of our designs as they were created in a variety of techniques including 1 warp, 1 weft; 1 warp 2 wefts; 2 warps, 2 wefts (double weave), 1 warp 3 wefts, samit(samitium). Students in both week’s classes came from a wide backgrounds: young and not so young, male and female, some with weaving knowledge others with computer skills. Weaving knowledge was not a prerequisite of the course and in many ways was not an advantage. However, knowledge of Photoshop was. It was a very challenging, intensive and rewarding course and I have come away with a collection of samples and files for some projects that will eventually be woven. One of my samples being woven. 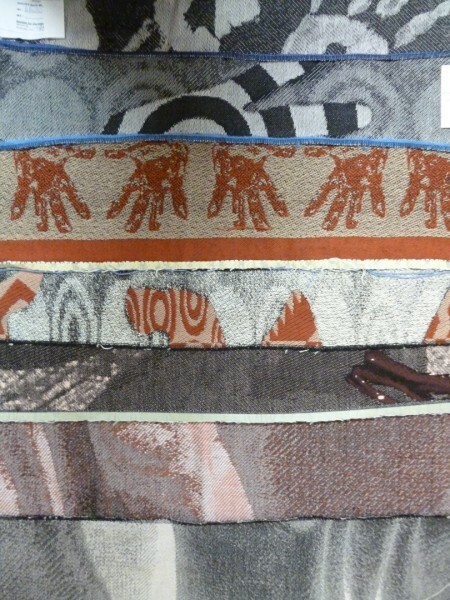 A batch of samples hot off the looms. My collection of samples from the two weeks. 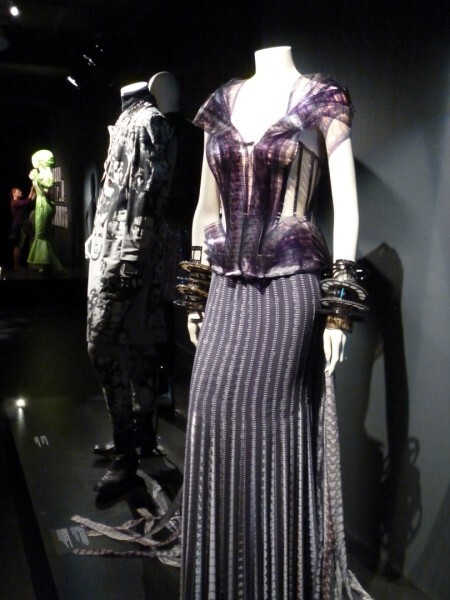 I was also very fortunate while in Montreal to see an exhibition by the French fashion designer, Jean Paul Gaultier. He has a reputation of being the enfant terrible of fashion. His intention is always to shake up the conventional and the bourgeois. While some of the fashions were controversial, others were quite beautiful. 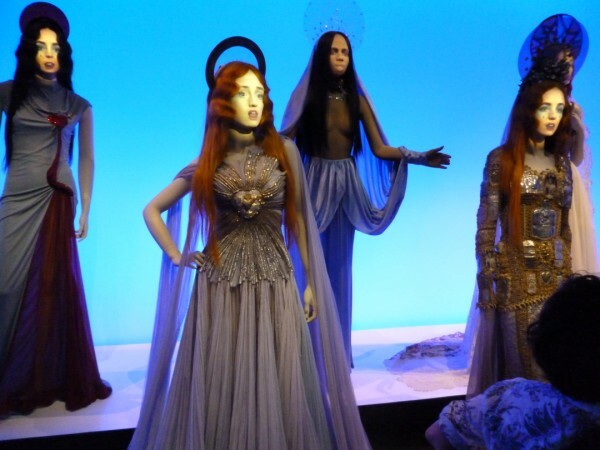 A view of some of the garments. These are from his virgins or madoonas series. In addition to the visit to Montreal, I wanted to go north of Toronto to Moosonee which is a very remote community at the end of the railway line just south of James Bay. The Moose Factory (not a building as such but rather a community on an island in the river opposite Moosonee) is the second oldest settlement in Canada and was originally the base of the Hudson Bay Fur Trading Company. I was hoping to see some Cree art and crafts. In addition, I had been reading about the Company and the Hudson Bay blankets that were used in trading. I was fascinated by the history of the area and the idea of the impact of its remoteness and harsh environment and wanted to find out more. I did manage to see some beading but there was not as much as I expected. I found out that beading originated through trading with the Company and was not a part of the Cree history before then. I was also surprised to see how many parallels there were with the Australian aboriginals and the impact of the white settlement. There too is a generation who were brought up in mission schools with similar outcomes to our “stolen generation”. 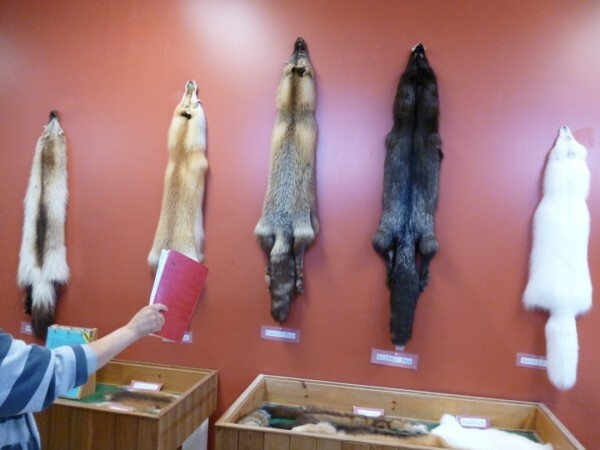 It was only when you saw a display furs that you realise the extent of the animals that were traded by the Hudson bay Fur Traders. This is not the full extent. Beaver fur (second from right) was popular for top hats. this exhibit was in the Cree Cultural Interpretive Centre. 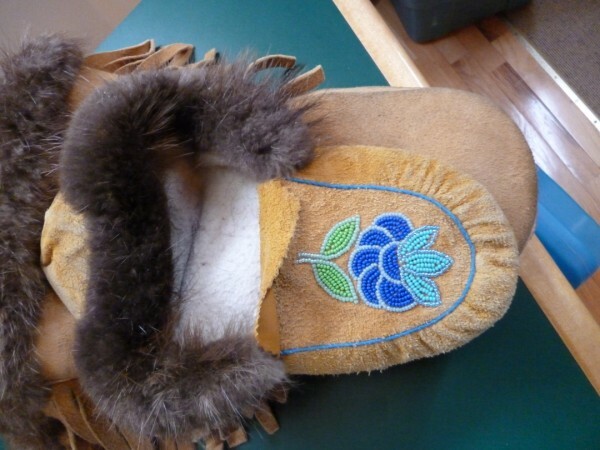 A completed moccasin with beaded floral design. The beads are threaded then the strand is couched down. I would like to thank Candice of the Moose River B&B for putting me in contact with various people in Moosonee. The month flew by. Now it’s back to working in the studio. You are currently browsing the Kay Faulkner's Blog blog archives for September, 2011.